It is commonly held that increased risk of influenza in the elderly is due to a decline in the Ab response to influenza vaccination. This study prospectively evaluated the relationship between the development of influenza illness, and serum Ab titers and ex vivo cellular immune responses to influenza vaccination in community dwelling older adults including those with congestive heart failure (CHF). Adults age 60 years and older (90 subjects), and 10 healthy young adult controls received the 2003-04 trivalent inactivated influenza vaccine. Laboratory diagnosed influenza (LDI) was documented in 9 of 90 older adults. Pre- and postvaccination Ab titers did not distinguish between subjects who would subsequently develop influenza illness (LDI subjects) and those who would not (non-LDI subjects). In contrast, PBMC restimulated ex vivo with live influenza virus preparations showed statistically significant differences between LDI and non-LDI subjects. The mean IFN-γ:IL-10 ratio in influenza A/H3N2-stimulated PBMC was 10-fold lower in LDI vs non-LDI subjects. Pre-and postvaccination granzyme B levels were significantly lower in CHF subjects with LDI compared with subjects without LDI. In non-CHF subjects with LDI, granzyme B levels increased to high levels at the time of influenza infection. In conclusion, measures of the ex vivo cellular immune response to influenza are correlated with protection against influenza while serum Ab responses may be limited as a sole measure of vaccine efficacy in older people. Ex vivo measures of the cell-mediated immune response should be incorporated into evaluation of new vaccines for older adults. Influenza is a major cause of hospitalization and death in older adults and has been associated with respiratory and cardiovascular complications including exacerbations of congestive heart failure (CHF)3. Most excess mortality during winter months in persons age 75 years and older has been attributed to influenza, particularly for cardiovascular diseases (1). Although only 50–60% effective for preventing illness, influenza vaccination may be up to 80% effective for preventing serious complications of influenza (2). Yet, despite widespread influenza vaccination programs, influenza-related hospitalization and death rates are rising (3, 4) and observational studies may be overestimating vaccination benefit (5). The need to develop more effective influenza vaccines for people age 65 and older is urgent. Measures of the immune response that correspond to risk for influenza illness are needed to develop new influenza vaccines that precisely target age-related immunologic changes. Current screening methods for evaluating new vaccines rely heavily on serologic responses. Ab titers, either seroconversion or seroprotection rates, following influenza vaccination as a sole measure of vaccine efficacy has recognized limitations (6). CTL have a key role in clearing influenza from the lungs (7) but are poorly stimulated by the current killed virus vaccines. Thus, many older people remain at risk for influenza illness despite influenza vaccination but the underlying immunologic defect that diminishes protection is poorly understood. A shift from Th1 cytokines (including IFN-γ) to Th2 cytokines (including IL-10) with aging has been associated with reduced CTL activity (8) and diminished protection against influenza virus challenge (9). Influenza is cleared by CTL through granule-mediated killing of virus-infected host cells; granzyme B (GrzB) is a key cytolytic mediator in this process (10) and an early marker of the CTL response to influenza infection (11). Virus-specific CTL are recruited to influenza-infected lungs by a Th1 response, specifically due to the production of IFN-γ (12). Although influenza-specific Th2 cytokines including IL-10 do not promote recovery from influenza infection (13), these cytokines continue to be expressed in high levels at the site of influenza infection. Thus, a balance between Th1 and Th2 cytokines appears to be important for viral clearance. Although age-related changes in the CTL response to influenza vaccination have been documented using 51Cr-release assays (14), the technique is too cumbersome to apply to the large samples required to determine the relationship between cytolytic activity and risk for influenza illness. GrzB activity is highly correlated with both cytolytic activity measured by 51Cr-release assays (15), declines with aging (16), and is associated with risk for influenza illness in institutionalized older people (17). The purpose of this study was to evaluate which serologic and ex vivo immunologic markers could distinguish older adults in the community who develop influenza illness, despite vaccination, from those who do not. 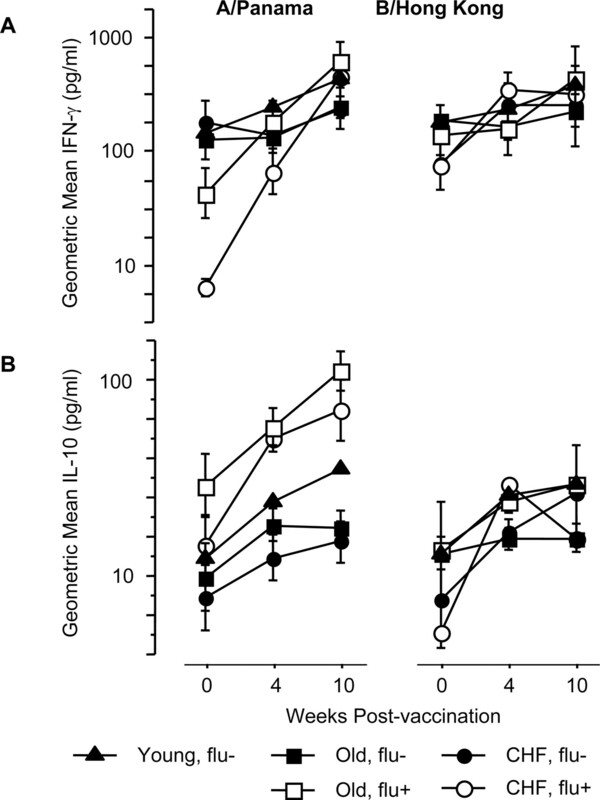 Our results suggest that ex vivo levels of IFN-γ, IL-10, and GrzB in virus-stimulated PBMC perform better than serum Ab titers as measures of risk for influenza illness. This was a prospective study of serum Ab titers and ex vivo T cell responses in vaccinated adults followed through the influenza season to detect influenza illness. Ninety adults age 60 years and older were recruited for the study; 53 without CHF, 37 with CHF. Ten healthy control subjects age 20–40 years old were recruited. An additional three young adults and eight older adults without CHF from the study populations were studied at 10 wk following vaccination in a subsequent influenza season. All volunteers were recruited through written informed consent. The Institutional Review Board of the University of Connecticut Health Center approved the protocol and informed consent document. Functional capacity was assessed in all older adult subjects at 4-wk postvaccination by performance on the Six-Minute Walk Test (SMWT) which correlates with peak oxygen uptake, and hospitalization and mortality rates in people with CHF (18, 19). All subjects received by deltoid injection, a split-virus preparation of the licensed 2003-04 trivalent influenza vaccine containing 15 μg each of A/New Caledonia/20/99 (H1N1), A/Panama/2007/99 (H3N2), and B/Hong Kong/330/2001-like virus. (Fluvirin; Evans Vaccines). Subjects studied in a subsequent influenza season received the 2005-06 vaccine. All subjects had received influenza vaccination in the previous year. Venous blood samples were collected prevaccination and 4 and 10 wk postvaccination. Volunteers who refused vaccination or had not been vaccinated in the previous year, had an egg allergy or previous severe reaction to the vaccine, or had an acute illness in the 2-wk period before vaccination were excluded. Surveillance for influenza-like illness (ILI) was conducted when influenza was circulating in the local community. Subjects reported ILI symptoms including respiratory (cough, shortness of breath, sore throat, coryza) and systemic (fatigue, myalgia, malaise, feverishness, or fever (>37.3°C)) symptoms (20). ILI was defined as two respiratory symptoms or one respiratory and one systemic symptom. Nasopharyngeal swabs for virus culture were collected if symptoms were reported within 72 h of onset. Laboratory diagnosed influenza illness (LDI) was defined as ILI associated with a positive influenza virus culture and/or seroconversion (4-fold rise in Ab titers from pre- to postillness). Serum Ab titers measured by hemagglutination inhibition assays were performed as previously described (21) using 2-fold dilutions of serum from 1/10 to 1/1024 and a single stock source for each of the hemagglutinin Ags (Centers for Disease Control, Atlanta, GA) and representing the strains of virus contained in the vaccine. Geometric mean titers were calculated using log10 conversion for each dilution. Seroprotection is defined as an Ab titer ≥40 and seroconversion as a 4-fold or greater rise in Ab titer from the prevaccination titer. Human PBMC were isolated from venous blood samples by Histopaque-1077 (Sigma-Aldrich) gradient purification and stimulated in serum-free AIM V medium (Invitrogen Life Technologies) containing 2.0 × 106 lymphocytes/ml, 50 hemagglutinating units/ml (∼107 50% tissue culture-infective doses/ml) of A/Panama/2007/99 or B/Hong Kong/330/2001 and 25 ng/ml recombinant human IL-7 (US Biological). PBMC supernatants and lysates (15) were harvested after 17 h of culture and frozen at −80°C until the study was completed. Gradient purified human PBMC used for FACS analysis were also treated with RBC Lysis Solution (Bio-Rad). A 1-ml cell suspension, 1.5 × 106/ml, was stimulated with IL-7 25 ng/ml and/or influenza virus A/Wyoming (50% tissue culture-infective dose = 3 × 106/ml, multiplicity of infection = 2) for 17 h. Brefeldin A (1/1000; eBioscience) was added for the last 4 h of culture. GrzB activity was measured in PBMC lysates by cleavage of the substrate, IEPDpna (Bachem), as previously described (15). GrzB activity was calculated as A405 U/mg protein in the PBMC lysate. IFN-γ and IL-10 levels were measured in PBMC supernatants using sandwich ELISA kits with a minimum level of detection of 2.0 pg/ml for IL-10 and 4.0 pg/ml for IFN-γ (eBioscience). Undetectable cytokine levels were assigned a value of one-half of the minimum level of detection. Abs used for flow cytometry were anti-CD4-FITC, anti-CD8-PerCP, anti-CD3-PE-Cy7 and anti-CD69-allophycocyanin-Cy7 (BD Pharmingen), anti-IFN-γ-allophycocyanin, anti-IL-10-PE (eBioscience), and Fv17 single chain anti-GrzB Ab labeled with FITC (KPK). Cells labeled with surface Abs then fixed and permeabilized for intracellular staining. Data were acquired on the BD LSR II, and analysis using Flow Jo software (Tree Star). Based on the comparison of subjects who developed LDI with those who did not, we tested Ab titers and ex vivo levels of IFN-γ, IL-10, and GrzB for their ability to predict risk of influenza illness. Because age, the presence or absence of CHF, performance on the SMWT, medications (lipid-lowering drugs (statins) and angiotensin-converting enzyme inhibitors (ACEI)), ex vivo cytokine levels, and Ab titers may be important in the immune response, they were assessed as potential confounders in the relationship between ex vivo cytokine and GrzB levels, and the development or not of LDI. All exploratory analyses were conducted on the data from the A/Panama strain. Adjusted analyses were repeated each virus strain. Serum Ab levels were calculated as the log10-transformed reciprocal titer and reported as the geometric mean titer (GMT) for each group or subset. Levels of GrzB and cytokines were log transformed (log10) to make them approximately normal. The SMWT was transformed to a nominal variable based on whether the distance walked was above or below the 75th percentile (> or ≤1146 ft). Differences in laboratory values between groups were assessed using the t test for parametric variables. Significance of the response to vaccination was tested using a paired t test. Analyses were performed using SPSS version 12.0. For initial exploratory data analysis, a general linear model was used to determine the relationships between cytokine levels and GrzB, and the development or not of LDI and for confounders in the analysis. We selected the covariates for inclusion in the final models if they were significantly predictive of cytokine or GrzB at the level of 0.05. For the adjusted analysis, there is a longitudinal effect that accounts for repeated measures within individuals. Thus, we included time and its interaction with covariates in the linear model and tested the hypotheses that low GrzB levels predict increased risk of developing LDI. Similar hypotheses were tested for cytokine levels where high levels of IFN-γ and low levels of IL-10 (also calculated as the IFN-γ:IL-10 ratio) predict increased risk for developing LDI. Nine of 90 older adults and none of the young adults developed LDI during the study. Two subjects were withdrawn due to serious adverse events unrelated to the study and were lost to follow-up due to discharge to a skilled nursing facility. A third subject deceased. None of these events were attributed to influenza illness. The study’s sentinel influenza case detected through influenza surveillance in the study population occurred in late November 2003. 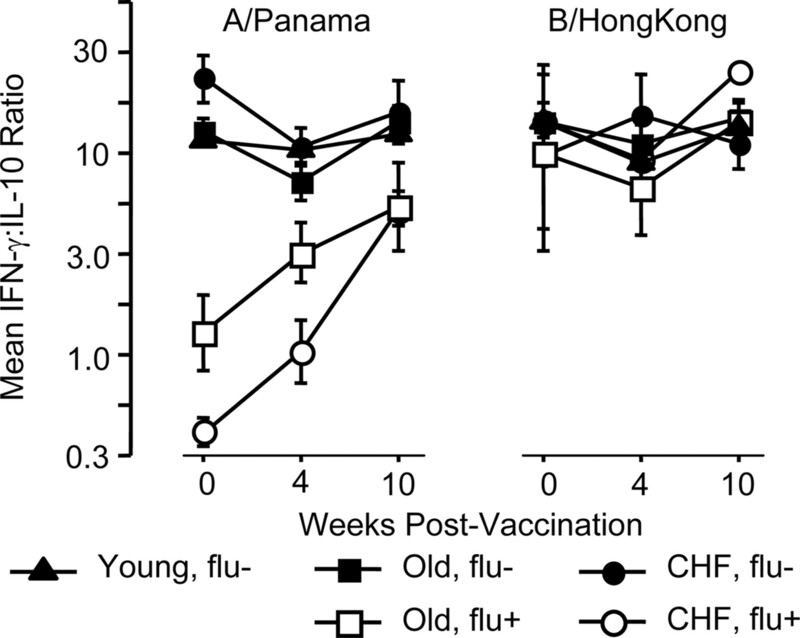 The predominant circulating strain of influenza was A/Fujian-like, a drifted variant from the A/Panama/2007/99 (H3N2) strain contained in the vaccine. As shown in Fig. 1⇓, older adults with CHF were vaccinated earlier in the study and returned for their 4-wk visit before influenza was circulating in the local community. Of the 37 CHF subjects, 4 subjects developed LDI between their 4- and 10-wk postvaccination visits (3 of 4 seroconverted to the A/Panama strain and 1 of 4 seroconverted to B/Hong Kong). The older adults without CHF were vaccinated later in the study and 5 of 53 non-CHF subjects developed LDI around the time of their 4-wk postvaccination visit (5 of 5 seroconverted to A/Panama, 1 of 5 was culture positive for an A/H3N2 strain). Timing of vaccination in relation to the outbreak of influenza in the local community. Anticipating an early influenza season in 2003, CHF subjects were vaccinated early in the study and older subjects without CHF were vaccinated later. Thus, subjects in the latter group who developed influenza experienced respiratory tract symptoms around the time of their 4-wk postvaccination visit. CHF subjects who developed influenza illness developed symptoms after their 4-wk visit. Humoral responses to influenza vaccination and influenza infection were monitored by serum Ab titers to the three vaccine strains (Table I⇓) and seroconversion and seroprotection rates (Table II⇓) in the different study groups and LDI subsets. Before LDI, there were no significant differences between LDI and non-LDI subjects in GMT or seroconversion or seroprotection rates to vaccination for either the A/Panama/2007/99 or the B/Panama/330/99 strains. In contrast, LDI compared with non-LDI subjects had significantly lower titers to the A/New Caledonia/20/99 strain which was not associated with influenza illness (GMT, p = 0.003; seroconversion, p = 0.02). In addition, only H1N1 titers showed age-related differences between young and older adults (p < 0.0001). By 10-wk postvaccination, Ab titers to A/Panama/2007/99 had increased following influenza infection in LDI subjects. The initial analysis of potential covariates in the relationship between cytokine and GrzB levels and the response to influenza vaccination excluded subjects who developed LDI due to the confounding effect of influenza infection. The analysis showed a significant association between cytokine and GrzB levels, and performance on the SMWT (above or below the 75th percentile) and medications (statins, ACEI). In the general linear model analysis, cytokine and GrzB levels were adjusted for these effects. As described below, the greatest differences between the groups and LDI subsets were observed in the IFN-γ:IL-10 ratios (Fig. 2⇓) and GrzB levels (Fig. 3⇓) in LDI vs non-LDI subjects during the 10-wk study. Geometric mean IFN-γ:IL-10 ratios in virus-stimulated PBMC cultures are shown for two of the vaccine strains, A/Panama (H3N2) and B/Hong Kong. Study groups included healthy young adults (Young), older adults without CHF (Old), and older adults with CHF. Older adults groups are further divided into the subset that developed influenza illness (flu+) and the subset that did not (flu−). Data are adjusted for medication use, including ACEI and statin lipid-lowering drugs, and for performance on the SMWT. Error bars represent SD. Geometric mean GrzB levels in virus-stimulated PBMC cultures are shown for two of the vaccine strains, A/Panama (H3N2) and B/Hong Kong. Study groups included healthy young adults (Young) and older adults with (CHF) or without CHF (Old). Older adults subsets that developed influenza illness (flu+) are compared with the subsets that did not (flu−). Old flu+ subjects developed influenza illness between the 4-wk postvaccination time point whereas the CHF flu+ subjects developed influenza illness between the 4- and 10-wk postvaccination time points. Data are adjusted for medication use, including ACEI and statin lipid-lowering drugs, and for performance on the SMWT. Error bars represent SD. Before vaccination, subjects who developed LDI had 10-fold lower levels of IFN-γ in A/H3N2-stimulated PBMC compared with non-LDI subjects (p < 0.0001; Fig. 4⇓A). Although the subjects without LDI showed no significant change in IFN-γ levels over the course of the study, the older adults who developed LDI (with or without CHF) showed significant increases in IFN-γ levels in A/H3N2-stimulated PBMC in a time-by-influenza-status comparison (p < 0.0001) to levels comparable to the non-LDI subjects. IL-10 levels increased in all groups following vaccination but LDI subjects with or without CHF had on average 3-fold higher levels of IL-10 in influenza-stimulated PBMC compared with non-LDI subjects. (p < 0.0001; Fig. 4⇓B). In contrast, IFN-γ and IL-10 levels in PBMC stimulated with influenza B were similar in LDI vs non-LDI subjects. These results are consistent with the lack of cross-reactivity between T cell responses to influenza A and influenza B.
Geometric mean IFN-γ (A) and IL-10 (B) levels in virus-stimulated PBMC cultures are shown for two of the vaccine strains, A/Panama (H3N2) and B/Hong Kong. Study groups included older healthy young adults (Young), older adults without CHF (Old), and adults with CHF. Older adults groups are further divided into the subset that developed influenza illness (flu+) and the subset that did not (flu−). Data are adjusted for medication use including ACEI and statin lipid-lowering drugs and for performance on the SMWT. Error bars represent SD. To evaluate the overall balance between Th1 and Th2 cytokines, the geometric mean IFN-γ:IL-10 ratio was calculated from the log-transformed cytokine levels adjusted for the effect of statins, ACEI, and SMWT, and compared between those who developed LDI and those who did not (Fig. 2⇑). In the subjects who did not develop LDI, geometric mean IFN-γ:IL-10 ratios were similar in young, older, and CHF subjects and did not significantly change over the course of the study. In contrast, the IFN-γ:IL-10 ratio was significantly lower prevaccination in older adults who developed LDI compared with non-LDI subjects. Although this ratio significantly increased following vaccination and illness (p < 0.0001), the geometric mean IFN-γ:IL-10 ratio remained significantly lower throughout the study in LDI compared with non-LDI subjects (p < 0.0001). In contrast, the IFN-γ:IL-10 ratio in influenza B-stimulated cultures did not differ between LDI and non-LDI subjects. Geometric mean GrzB levels for each of the groups and LDI subsets changed over the course of the study and corresponded to the effect of vaccination and timing of the LDI relative to the time of vaccination (Fig. 1⇑). Using geometric mean GrzB levels adjusted for the effect of statins, ACEI, and SMWT, differences between the LDI and non-LDI subsets were noted only in A/Panama-stimulated PBMC; B/Hong Kong-stimulated PBMC were not statistically different. In A/Panama-stimulated PBMC, subsets of young and older adults with or without CHF who did not develop LDI showed a small but significant increase in geometric mean GrzB levels following vaccination from 1.95 to 3.44 U/mg protein (p ≤ 0.001) with no significant differences between these three groups (Fig. 3⇑). CHF subjects who later developed LDI had lower levels of GrzB and a poor response to vaccination; geometric mean 1.21 U/mg protein prevaccination and 1.23 U/mg protein 4-wk postvaccination. In this group, geometric mean GrzB levels significantly increased following LDI to 1.73 U/mg protein at 10 wk but remained significantly lower than the non-LDI groups at all time points (p < 0.0001). In contrast, older subjects without CHF who developed LDI around 4-wk postvaccination showed a corresponding significant elevation of geometric mean GrzB levels at 8.13 U/mg protein, which reflects the combined response to influenza vaccination and infection. It should be highlighted that the four CHF subjects who developed LDI had protective levels of Ab to the infecting strain of influenza but significantly lower IFN-γ:IL-10 ratios and GrzB levels than subjects who did not go on to develop LDI. To further investigate differences in the level of expression of IFN-γ, IL-10, and GrzB in different T cell populations between those older adults who developed LDI and those that did not, frozen PBMC were stored from each of the subjects at 0, 4, and 10 wk postvaccination. However, we found the older compared with young adults showed both poor and variable recovery of viable PBMC, raising concerns that any comparisons between the PBMC from those who developed LDI vs those that did not would be confounded by the effect of freezing. As an alternative, experiments to explore whether or not these LDI-related changes in the cellular immune response could be linked to age-related changes in the expression of IFN-γ, IL-10, and GrzB were performed. Fresh PBMC from a subset of the young (three subjects) and older adult (eight subjects) study populations were obtained 10 wk following vaccination with the 2005-06 influenza vaccine and stimulated with the A/H3N2 vaccine strain. Intracellular staining for IFN-γ, IL-10, and GrzB in CD3+CD4+ and CD3+CD8+ T cells was performed using CD69+ as an activation marker. Fig. 5⇓ includes representative scatter plots from young and older adults showing that >95% of CD4+ or CD8+ that express GrzB are activated (CD69+) T cells. Similar results were found for both IFN-γ and IL-10, showing that most of the T cells expressing these cytokines were CD69+ (data not shown). In addition, these activated CD4+ and CD8+ cells appear to coexpress IFN-γ, IL-10, and GrzB (Fig. 5⇓). A comparison between young and older adults showed a trend toward an age-related decline in the proportion of activated CD8+ cells expressing IFN-γ, IL-10, and GrzB (Fig. 6⇓). The presence of IL-7 in virus-stimulated PBMC did not change the relative proportion CD4+ or CD8+ cells producing IFN-γ/IL-10 and GrzB but may slightly increase the absolute proportion. As shown in Fig. 7⇓, in PBMC from young adults, most of the GrzB was expressed in CD8+ cells and very little in CD4+ cells. In contrast in older adult PBMC, GrzB is expressed in a lower proportion of CD8+ cells with an increase in the proportion CD4+ cells expressing GrzB albeit at a lower intensity. Similar results for young and older adults were obtained for IFN-γ/IL-10-producing CD4+ and CD8+ cells. 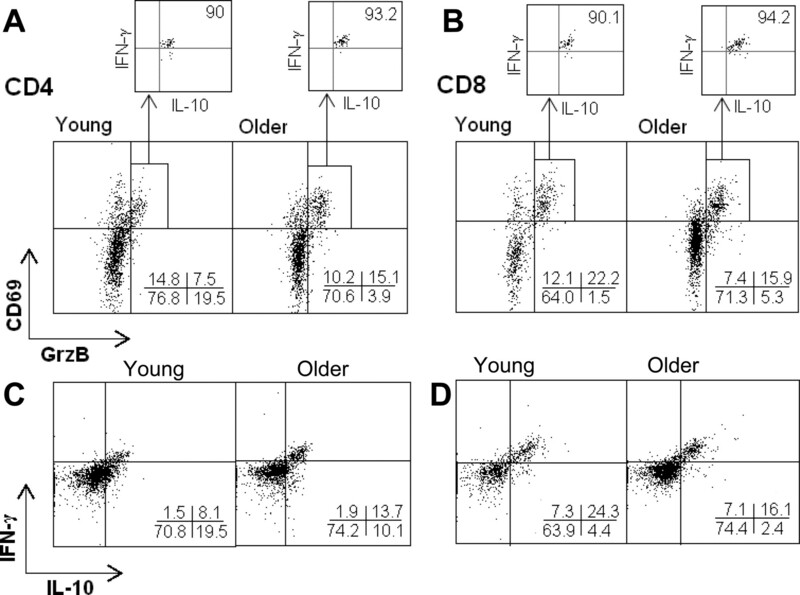 Phenotype of influenza-specific CD4+ and CD8+ cells from young and older adults. PBMC were stimulated for 17 h with live influenza virus in the presence of IL-7 and the phenotype of influenza-specific T cells (CD3+) measured by flow cytometry using intracellular staining for IFN-γ, IL-10, and GrzB in activated (CD69+) T cell subsets. GrzB+ cells are CD69+ (>95%) in both CD4+ (A) and CD8+ (B) subsets. Similarly, >95% of IFN-γ+ and IL-10+ cells were CD69+ in CD4+ and CD8+ subsets (data not shown). IFN-γ+ and IL-10+ T cells often coexpressed the two cytokines in activated T cells in CD4+ (C) and CD8+ (D) subsets. The offset scatter plots for CD4+ (A) and CD8+ (B) show that >90% of CD69+GrzB+ cells are also IFN-γ+IL-10+. Similar results were also found for virus-stimulated PBMC in cultures that did not contain IL-7 (data not shown). Frequency of activated CD4+ and CD8+ T cells expressing IFN-γ, IL-10, and GrzB. PBMC from young and older adults were cultured for 17 h in the presence of no virus or IL-7 (control), live influenza virus (virus), IL-7 alone (IL-7), or live influenza virus and IL-7 (IL-7 + virus). The proportions (pptn) of PBMC that were CD69+GrzB+ or IFN-γ+IL-10+ were significantly higher in cultures containing virus or virus plus IL-7, compared with controls (with or without IL-7) in both CD4+ and CD8+ T cell (CD3+) subsets (p < 0.0001). The proportion of cells that were CD4+CD69+GrzB+ (A) or CD4+CD69+IFN-γ+IL-10+ (C) did not significantly differ between young and older adults. There was a trend toward a higher proportion of CD8+CD69+GrzB+ (B) and CD8+CD69+IFN-γ+IL-10+ (D) in young compared with older adults. The addition of IL-7 to the PBMC cultures did not alter the proportion cells expressing these cytokines or GrzB. 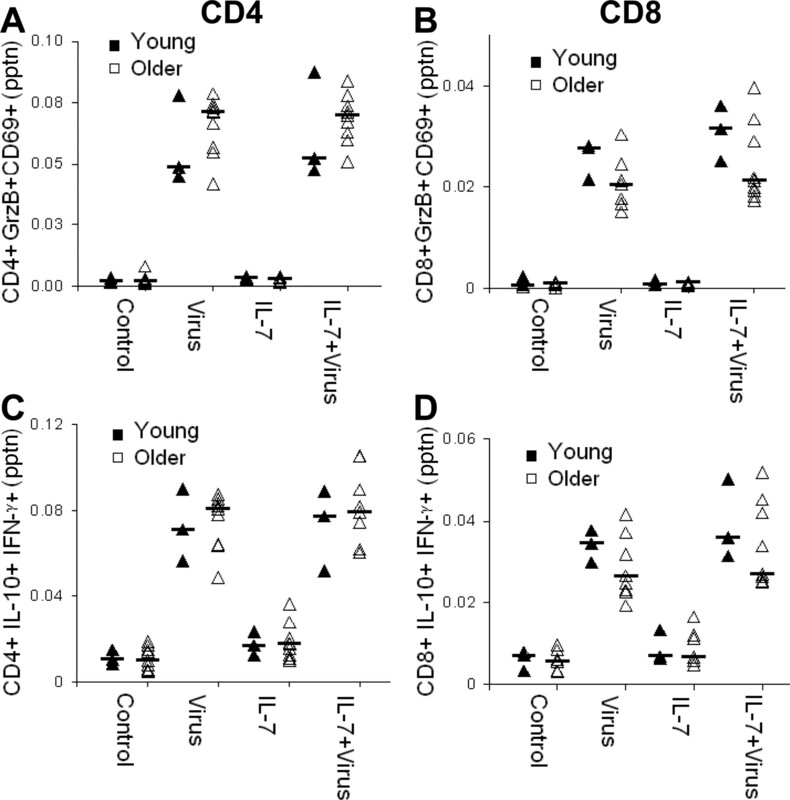 GrzB levels per CD4+ and CD8+ T cells from young and older adults. PBMC were stimulated for 17 h with live influenza virus in the presence of IL-7 and the amount of GrzB per T cell measured by flow cytometry and intracellular staining for GrzB in CD4+ and CD8+ T cell (CD3+) subsets. 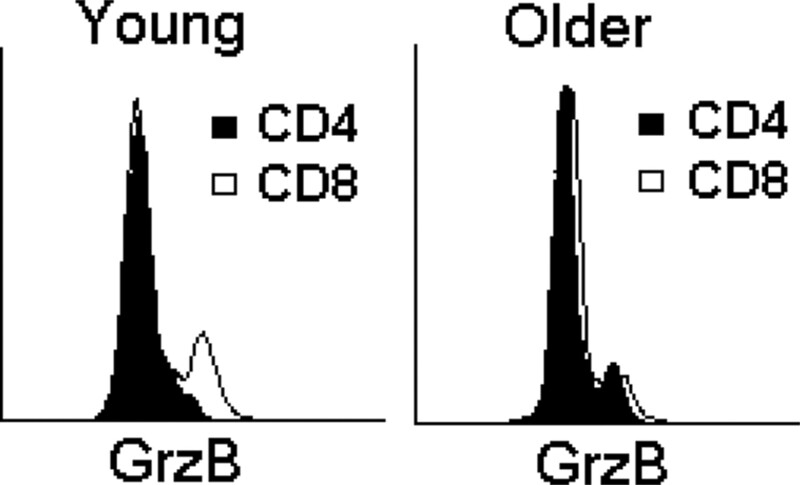 Representative histograms show that T cells expressing GrzB in young adult PBMC are largely CD8+ whereas in older adult PBMC, T cells expressing GrzB were found in both CD4+ and CD8+ subsets with the CD4+ producing less GrzB on a per cell basis. Similar differences between young and older adults were found in the CD4+ and CD8+ cells that coexpressed IFN-γ and IL-10 (data not shown). This study evaluated the humoral and cellular immune response to influenza in vaccinated older people as predictors of risk for influenza illness. Although the circulating strain of influenza, A/Fuijan/411/2002 (H3N2)-like, was an antigenic drift variant from the A/Panama/2007/99 (H3N2) vaccine strain, there was sufficient cross-reactivity between the two viruses to detect seroconversion to A/Fuijan-mediated illness. Cross-reactive T cell epitopes within the different strains of influenza A or B (22) enabled the comparison of T cell response to the influenza A strain in LDI vs non-LDI subjects and the contrasting results with influenza B. In subjects who did not develop LDI, the Th1/Th2 cytokine ratio measured ex vivo remained constant throughout the study. However, significant differences in the IFN-γ:IL-10 ratio between LDI and non-LDI subjects were observed. The lower ratio in LDI subjects reflects a shift toward a Th2 response and is a potential marker of continued risk for influenza illness despite vaccination. Neither vaccination nor infection restored the IFN-γ:IL-10 ratio to the levels observed in the non-LDI subsets. Consistent with the lack of cross-reactivity between influenza A and B, differences between LDI and non-LDI subsets in influenza A-stimulated cultures were not shown in influenza B-stimulated PBMC. The low IFN-γ:IL-10 ratio in LDI subjects is related to both an underproduction of IFN-γ and overproduction of IL-10, however, the source of these cytokines from among cells of both the innate and immune response have not been identified. Although T cells appear to produce both cytokines early in culture, it may be that LDI-related changes in these cytokines are individually determined by changes in other PBMC populations that produce these cytokines including NK cells, B lymphocytes, monocytes, and dendritic cells. Significantly lower levels of GrzB and a poor GrzB response to vaccination were observed at 4-wk postvaccination in CHF subjects who later developed LDI. Consistent with influenza infection being a more potent stimulus of CTL compared with killed-virus vaccine (23), GrzB levels to influenza A significant increased following influenza illness. However, low levels of GrzB even after infection suggest that the defect in the CTL response to vaccination cannot be completely reversed with influenza infection. Our follow-up experiments showing that GrzB is expressed in both CD4+ and CD8+ T cells in older adults suggest that both of these T cell subsets may have CTL activity whereas in young adults, this activity is largely in the CD8+ subset. Previous experiments have shown that very few of activated NK cells (CD14+CD56+; J. E. McElhaney and D. Xie, unpublished observations) from young or older adults are GrzB+ in 17-h PBMC cultures, although the source of GrzB following infection could not be evaluated in this study. Because of the early influenza season, CHF subjects were given priority for vaccination. Thus, LDI subjects without CHF were vaccinated relatively late and the significant increase in GrzB levels measured at 4-wk postvaccination in this subset reflects the combined response to influenza vaccination and infection. In the absence of CHF, live virus appears to be a potent stimulator of GrzB even in older adults. New influenza vaccines that target this CTL response may thus be more effective compared with the current killed-virus vaccines. Future experiments will be designed to study the relative amounts of GrzB produced by CD4+ vs CD8+ T cells comparing older adults with low GrzB levels, and intermediate and high levels of Grz B in ex vivo PBMC cultures. Influenza-stimulated PBMC cultures contained IL-7, a cytokine that prevents activation-induced cell death of Th cells (24, 25) and declines with aging (26). Our results suggest that IL-7 does not appreciably change the pattern of cytokine or GrzB production in those who do not have a demonstrated increased risk for influenza. However, IL-7 may have affected the memory T cell response (27) in those older subjects with or without CHF who did develop LDI. Because IL-7 does not change virus-specific CTL precursor frequency (28), our results are consistent with other studies; in general, precursor frequencies for influenza virus-specific CTL are maintained with aging (29). Taken together, our results suggest that these ex vivo conditions can identify older people at increased risk for influenza. ACEI and statin medications have been associated with suppressed inflammatory responses and decreased risk for heart disease (30, 31). Although lower levels of inflammatory cytokines have been associated with risk reduction for heart disease, a balance of inflammatory and anti-inflammatory cytokines may be important (32). Indeed, serum levels of the inflammatory cytokine, IL-6, were significantly lower in older adults (with or without CHF) before LDI compared with non-LDI subjects (J. E. McElhaney, unpublished data). ACEI and statins also had variable interactions with cytokine and GrzB levels and the statistical adjustment for these effects more clearly delineates influenza risk based on these immunologic markers. The limitation of this study is the relatively small number of subjects who developed LDI (attacks rates were consistent with the predicted attack rates in this population). Nevertheless, we were able to demonstrate statistically significant differences in cytokine and GrzB responses between LDI and non-LDI subsets. Ab titers did not detect this difference in response to vaccination. Although there was cross-reactivity between Abs to the vaccine and circulating A/H3N2 strains, a difference between LDI and non-LDI subsets may have been demonstrated if the vaccine and circulating strains were identical. Further, this strain mismatch may have increased dependence on the T cell-mediated memory to protect against influenza illness. Four CHF subjects, who despite Ab titers indicative of protective responses at 4-wk postvaccination, went on to have influenza infection leading to LDI between 4- and 10-wk postvaccination. The analysis in the non-CHF subset who developed LDI was complicated by the combined effects of vaccination and infection at 4-wk postvaccination. The crucial data in support of our conclusion are that all CHF subjects who developed LDI despite protective Ab titers had low IFN-γ:IL-10 ratios and GrzB activity before the onset of illness compared with subjects who did not develop LDI. Thus, when compared with Ab responses, measures of cellular immunity were more sensitive markers of continued risk for influenza illness following vaccination. In summary, Ab titers to influenza may be unreliable for predicting risk for influenza illness in older people. An ex vivo assay of the cytokine and GrzB response to influenza vaccination may be a useful adjunct to Ab titers for predicting influenza risk and identifying defects in the immune response to influenza vaccination. Key to improving protection in older people is the identification of the immunologic defects associated with influenza illness that can be targeted in the development of more effective influenza vaccines in this population. We thank Martha Hein and the staff of the Lowell P. Weicker, Jr. General Clinical Research Center for coordination of the study, Lisa Kenyon-Pesce in the UConn Center on Aging for subject recruitment, Laura Kearney in the Heart Failure Clinic for her clinical support to this study, and Norine Kuhn for her excellent technical assistance. ↵1 This work was supported by National Institutes of Health (NIH), National Institute on Aging Grant R01 AG20634, and National Institute of Allergy and Infectious Diseases Grant R01 AI68265 (to J.E.M., Principal Investigator). The study was conducted through the Lowell P. Weicker, Jr., General Clinical Research Center funded by NIH, National Center for Research Resources Grant MO1 RR06192 at the University of Connecticut Health Center, and in collaboration with the UConn Center on Aging. The work was also supported by grants from the Canadian Institutes of Health Research (CIHR), and the Canadian Network of Vaccine Centers of Excellence. R.C.B is a CIHR Distinguished Scientist, a Medical Scientist of the Alberta Heritage Foundation for Medical Research (AHFMR), a Canada Research Chair, and a Howard Hughes International Scholar. K.P.K. is an AHFMR Scientist. ↵3 Abbreviations used in this paper: CHF, congestive heart failure; GrzB, granzyme B; SMWT, Six-Minute Walk Test; ILI, influenza-like illness; LDI, laboratory diagnosed influenza illness; ACEI, angiotensin-converting enzyme inhibitor; GMT, geometric mean titer. Reichert, T. A., L. Simonsen, A. Sharma, S. A. Pardo, D. S. Fedson, M. A. Miller. 2004. Influenza and the winter increase in mortality in the United States, 1959–1999. Am. J. Epidemiol. 160: 492-502. Govaert, T. M., C. T. Thijs, N. Masurel, M. J. Sprenger, G. J. Dinant, J. A. Knottnerus. 1994. The efficacy of influenza vaccination in elderly individuals: a randomized double-blind placebo-controlled trial. J. Am. Med. Assoc. 272: 1661-1665. Thompson, W. W., D. K. Shay, E. Weintraub, L. Brammer, C. B. Bridges, N. J. Cox, K. Fukuda. 2004. Influenza-associated hospitalizations in the United States. J. Am. Med. Assoc. 292: 1333-1340. Thompson, W. W., D. K. Shay, E. Weintraub, L. Brammer, N. Cox, L. J. Anderson, K. Fukuda. 2003. Mortality associated with influenza and respiratory syncytial virus in the United States. J. Am. Med. Assoc. 289: 179-186. Simonsen, L., T. A. Reichert, C. Viboud, W. C. Blackwelder, R. J. Taylor, M. A. Miller. 2005. Impact of influenza vaccination on seasonal mortality in the US elderly population. Arch. Intern. Med. 165: 265-272. Govaert, T. M., M.J. Sprenger, G. J. Dinant, K. Aretz, N. Masurel, J. A. Knottnerus. 1994. Immune response to influenza vaccination of elderly people: a randomized double-blind placebo-controlled trial. Vaccine 12: 1185-1189. Doherty, P. C., D. J. Topham, R. A. Tripp, R. D. Cardin, J. W. Brooks, P. G. Stevenson. 1997. Effector CD4+ and CD8+ T-cell mechanisms in the control of respiratory virus infections. Immunol. Rev. 159: 105-117. Hsu, H. C., D. K. Scott, J. D. Mountz. 2005. Impaired apoptosis and immune senescence—cause or effect?. Immunol. Rev. 205: 130-146. Taylor, S. F., R. J. Cottey, D. S. Zander, B. S. Bender. 1997. Influenza infection of β2-microglobulin-deficient (β2m−/−) mice reveals a loss of CD4+ T cell functions with aging. J. Immunol. 159: 3453-3459. Johnson, B. J., E. O. Costelloe, D. R. Fitzpatrick, J. B. Haanen, T. N. Schumacher, L. E. Brown, A. Kelso. 2003. Single-cell perforin and granzyme expression reveals the anatomical localization of effector CD8+ T cells in influenza virus-infected mice. Proc. Natl. Acad. Sci. USA 100: 2657-2662. Lawrence, C. W., R. M. Ream, T. J. Braciale. 2005. Frequency, specificity, and sites of expansion of CD8+ T cells during primary pulmonary influenza virus infection. J. Immunol. 174: 5332-5340. Baumgarth, N., A. Kelso. 1996. Functionally distinct T cells in three compartments of the respiratory tract after influenza virus infection. Eur. J. Immunol. 26: 2189-2197. Graham, M. B., V. L. Braciale, T. J. Braciale. 1994. Influenza virus-specific CD4+ T helper type 2 T lymphocytes do not promote recovery from experimental virus infection. J. Exp. Med. 180: 1273-1282. Powers, D. C., R. B. Belshe. 1993. Effect of age on cytotoxic T lymphocyte memory as well as serum and local antibody responses elicited by inactivated influenza virus vaccine. J. Infect. Dis. 167: 584-592. Ewen, C., K. P. Kane, I. Shostak, P. J. Griebel, E. M. Bertram, T. H. Watts, R. C. Bleackley, J. E. McElhaney. 2003. A novel cytotoxicity assay to evaluate antigen-specific CTL responses using a colorimetric substrate for granzyme B. J. Immunol. Methods 276: 89-101. McElhaney, J. E.. 2005. The unmet need in the elderly: targeting new influenza vaccines in older adults. Vaccine 23: (Suppl. 1):S10-S25. McElhaney, J. E., S. Gravenstein, C. M. Upshaw, J. W. Hooton, P. Krause, P. Drinka, R. C. Bleackley. 2001. Granzyme B: a marker of risk for influenza in institutionalized older adults. Vaccine 19: 3744-3751. Hendrican, M. C., R. S. McKelvie, T. Smith, N. McCartney, J. Pogue, K. K. Teo, S. Yusuf. 2000. Functional capacity in patients with congestive heart failure. J. Card. Fail. 6: 214-219. Bittner, V., D. H. Weiner, S. Yusuf, W. J. Rogers, K. M. McIntyre, S. I. Bangdiwala, M. W. Kronenberg, J. B. Kostis, R. M. Kohn, M. Guillotte, et al 1993. Prediction of mortality and morbidity with a 6-minute walk test in patients with left ventricular dysfunction: SOLVD investigators. J. Am. Med. Assoc. 270: 1702-1707.
WHO Collaborating Center for Influenza 1981. The Hemagglutination Inhibition Test For Influenza Viruses, Revised 1-21. Department of Health, Education, and Welfare, Public Health Service, Centers for Disease Control, Center for Infectious Disease, Atlanta. Effros, R. B., P. C. Doherty, W. Gerhard, J. Bennink. 1977. Generation of both cross-reactive and virus-specific T-cell populations after immunization with serologically distinct influenza A viruses. J. Exp. Med. 145: 557-568. McMichael, A. J., F. Gotch, P. Cullen, B. Askonas, R. G. Webster. 1981. The human cytotoxic T cell response to influenza A vaccination. Clin. Exp. Immunol. 43: 276-284. Kang, I., M. S. Hong, H. Nolasco, S. H. Park, J. M. Dan, J. Y. Choi, J. Craft. 2004. 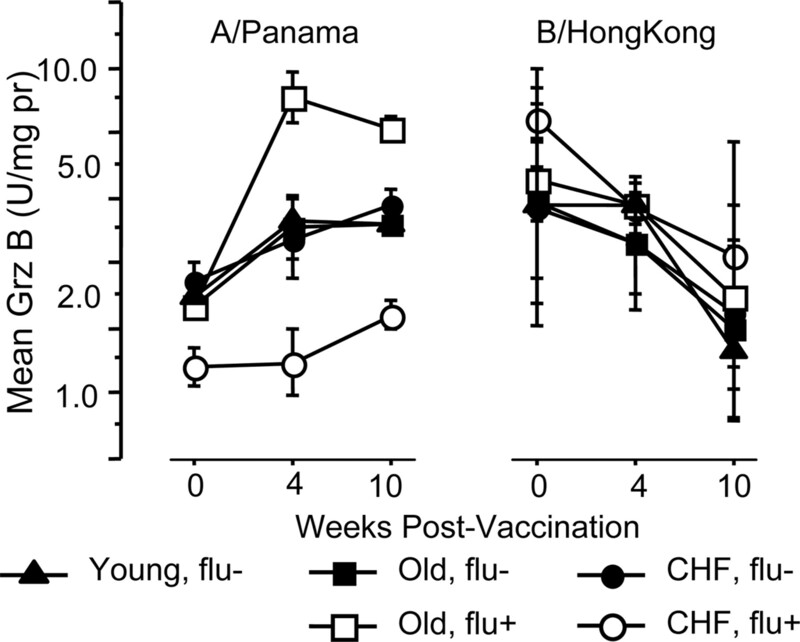 Age-associated change in the frequency of memory CD4+ T cells impairs long term CD4+ T cell responses to influenza vaccine. J. Immunol. 173: 673-681. Aspinall, R., S. Henson, J. Pido-Lopez, P. T. Ngom. 2004. Interleukin-7: an interleukin for rejuvenating the immune system. Ann. NY Acad. Sci. 1019: 116-122. Lalvani, A., T. Dong, G. Ogg, A. A. Patham, H. Newell, A. V. Hill, A. J. McMichael, S. Rowland-Jones. 1997. Optimization of a peptide-based protocol employing IL-7 for in vitro restimulation of human cytotoxic T lymphocyte precursors. J. Immunol. Methods 210: 65-77. Boon, A. C., E. Fringuelli, Y. M. Graus, R. A. Fouchier, K. Sintnicolaas, A. M. Iorio, G. F. Rimmelzwaan, A.D. Osterhaus. 2002. Influenza A virus specific T cell immunity in humans during aging. Virology 299: 100-108. Ascer, E., M. C. Bertolami, M. L. Venturinelli, V. Buccheri, J. Souza, J. C. Nicolau, J. A. Ramires, C. V. Serrano, Jr. 2004. Atorvastatin reduces proinflammatory markers in hypercholesterolemic patients. Atherosclerosis 177: 161-166. Schieffer, B., H. Drexler. 2003. Role of 3-hydroxy-3-methylglutaryl coenzyme a reductase inhibitors, angiotensin-converting enzyme inhibitors, cyclooxygenase-2 inhibitors, and aspirin in anti-inflammatory and immunomodulatory treatment of cardiovascular diseases. Am. J. Cardiol. 91: 12H-18H. Mills, R., D. L. Bhatt. 2004. The Yin and Yang of arterial inflammation. J. Am. Coll. Cardiol. 44: 50-52.